Donald R. Keough, chair emeritus of the University of Notre Dame Board of Trustees, chair of Allen & Company and former president and chief operating officer of the Coca-Cola Company, died Tuesday (Feb. 24) in Atlanta with family members at his side. He was 88. 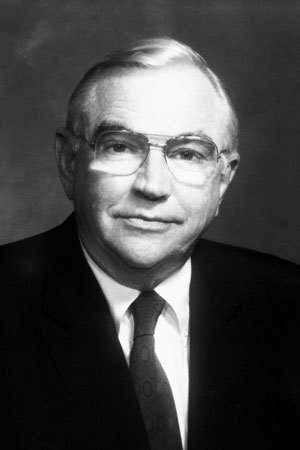 Keough served as a Trustee since 1978 and chair from 1986 to 1991. The Keough School of Global Affairs, the first new school to be established at Notre Dame in nearly a century, is only the most recent example of generosity to the University by Don and his wife of 65 years, Marilyn. In addition to Jenkins Hall, which will house the new school, the Keoughs’ benefaction has made possible Notre Dame’s Keough-Naughton Institute for Irish Studies; two endowed chairs in Irish studies; the summer internship program in Ireland; Malloy Hall, which houses the Departments of Theology and Philosophy; three library collections; the restoration of O’Connell House in Dublin; the Keough-Hesburgh Professorships for leading scholars committed to Notre Dame’s Catholic mission; and a men’s residence hall named in Marilyn Keough’s honor. Five of their children — Shayla Keough Rumely; Michael, Patrick and Clarke Keough; and Eileen Keough Millard — are Notre Dame graduates. Shayla is a member of the University’s Board of Trustees, and Michael, Patrick, Clarke and Eileen serve on Notre Dame advisory councils. The recipient of many honors, Keough received an honorary doctorate from Notre Dame in 1985 and was awarded the University’s highest honor, the Laetare Medal, in 1993. Marilyn received a Notre Dame honorary doctorate in 1998. Keough remained actively engaged at Notre Dame throughout his life, participating in last month’s meeting of the Board of Trustees. He was also involved in plans for the 2017 opening of the Keough School and with the Keough-Naughton Institute’s role with the Irish government in next year’s centennial commemoration of the 1916 uprising. Visitation will take place Monday (March 2) from 5 to 7 p.m. EST, and a funeral Mass will be celebrated Tuesday (March 3) at 10 a.m., both at The Cathedral of Christ the King, 2699 Peachtree Road in Atlanta. Originally published by Paul J. Browne at news.nd.edu on February 24, 2015.